In my practice, I have worked with my fair share of single women in their 30s, 40s, and 50s. Most of these women express a desire to be in a long-term relationship and eventually married. Not every woman desires relationships or marriage, and many are content to remain single. I want to be clear that single women are not damsels in distress waiting to be rescued. However, I want to speak specifically to those who desire to date, be in a committed relationship, or be married, and for whom it’s currently not happening. It can be tempting to minimize this desire with platitudes such as: “You’ll find someone,” “But you’re so young!” and “Don’t worry so much about it.” These do not often give voice to the single woman’s experience. For clinicians working with this population, it’s important to remember the following. Reflect the pain and loneliness you notice and make space for the sadness, as it may have often been minimized by others. The pain and sadness of being single is real. It may be difficult for these women to discuss this with friends who are already married because they feel their experience won’t be understood. It may be difficult for them to discuss this with their single friends, as they are in the same situation. They may feel silly for wanting a life partner or feel as if they should be more independent. As their therapist, you can offer compassion for their painful experience. 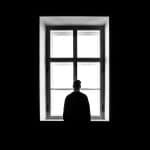 Reflect the pain and loneliness you notice and make space for the sadness, as it may have often been minimized by others. You can also offer validation for their current experience, as dating and not finding anyone can be its own set of discouragements. Being in a relationship has some tangible advantages. From finances, to chores, to emotional support, you have someone you can lean on. Talk through the practical side of things with your single female clients. They may not feel they have someone they can rely on if they have to go to the hospital in an emergency. They may be wondering if they lose their housing whether someone will take them in. This is only compounded for single women who do not have family they can call upon for help. Help them build upon their support network. Ask them questions like “Who can you call on in times of trouble?” “Where can you find like-minded people to form a ‘family’ with?” Consider the adage, You cannot choose who you’re related to, but you can choose your friends. Encouraging single women to live their lives as fully as possible will allow them to build the support network they need. This might include things like joining a club, church, or religious organization, playing sports, or traveling. Talk with your clients about what they enjoy and how they can connect with others in an effort to build upon their supports. These statements only serve the purpose of making women feel worse. They look inside and ask the question “How come I haven’t found anyone yet?” which only induces more shame and guilt. They watch on social media as their friends pair off one by one, and the same is true for television and movies. Shows like The Bachelor have become incredible main stays because they highlight this very notion, that life should end in some kind of lavish engagement. This creates an incredible amount of pressure for single women who want to be married. Explore with your clients what this is like. What kind of messages are they receiving about being single? What do they do with these messages? Are there people in their life that pressure them in a way that is unhealthy? Can they set boundaries with those who are constantly asking about their marital state? Help them develop an inner voice that is able to connect with what it really wants. Sometimes it can be easy to get caught up in the messages that media and friends are setting, and the single women forgets to listen to her own voice. Singleness is not just about not having someone in your life; there is meaning behind not being in a relationship, and this is necessary to look at. For many single women at a certain age, it means not being able to have children. This is a reality for women who are not able to freeze their eggs, do surrogacy, and do not plan to adopt or foster children. There is grief that goes along with this reality. As a therapist, it is important to validate the sadness that goes along with this loss. Likely, these women may feel uncomfortable broaching the subject with their parenting friends, and it can be helpful when a professional wants to know more about their experience. Explore the loss with your clients and allow them to talk about the other losses connected with it, such as not “providing” grandchildren or not having someone to carry on their family name. Providing a safe space to process loss that may seem confusing to others can be incredibly important. I waited three months after I was discharged from the hospital for suicidal depression to make contact with the professional world again. I wanted to be sure I didn’t “crack,” like I had done in a group therapy session. A publishing conference seemed like an ideal, safe place to meet. A crowded room of book editors would certainly prevent any emotional outbursts on my part. So I reached out to colleague who had been feeding me assignments pre-nervous breakdown and invited her for a cup of coffee. “How are you?” she asked me. Instead I burst into tears. Not a cute little whimper. A loud and ugly bawling — pig snorts included — the kind of sobbing widows do behind closed doors when the funeral is done. But something peculiar happened in that excruciating exchange: we bonded. 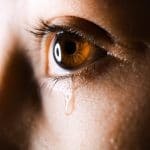 Researchers at the University of California, Berkley conducted five studies that confirmed this very phenomena: embarrassment — and public crying certainly qualifies as such — has a positive role in the bonding of friends, colleagues, and mates. The findings, published in the Journal of Personality and Social Psychology, suggest that people who embarrass easily are more altruistic, prosocial, selfless, and cooperative. In their gestures of embarrassment, they earn greater trust because others classify the transparency of expression (buried head, blushing, crying) as trustworthiness. Now public crying is even better than splitting your swimsuit in half during swim practice or asking a woman when her baby is due only to learn it was born four months ago (also guilty). Tears serve many uses. According to Dr. William Frey II, a biochemist and Director of the Alzheimer’s Research Center at Regions Hospital in St. Paul, Minnesota, emotional tears (as opposed to tears of irritability) remove toxins as well as chemicals like the endorphin leucine-enkaphalin and prolactin that have built up in the body from stress. Crying also lowers a person’s manganese level, a mineral that affects mood. Crying is an exocrine process, that is, a process in which a substance comes out of the body. Other exocrine processes, like exhaling, urinating, defecating and sweating, release toxic substances from the body. There’s every reason to think crying does the same, releasing chemicals that the body produces in response to stress. Anthropologist Ashley Montagu once said in a Science Digest article that crying builds a community. Having done my share of public crying this last year, I think he is right. If you spot a person crying in the back of the room at, say, a school fundraiser, your basic instinct (if you are a nice person) is to go comfort that person. Yeah, there’s the voice that says she’s pathetic for displaying public emotions, much like the couple fighting in the hallway; however, you want the crying to end because on some level it makes you uncomfortable — you want everyone to be happy, like the mom who pops a pacifier or a stick of butter into her 6-year-old’s mouth to shut him up. The high sensitive types begin to swarm around this woman, as she divulges her life story. Voila! You find yourself with a group of new best friends in an Oprah moment, each person offering intimate details about herself. A women’s retreat has started, and there is no need for a lake house. In a February 2016 study published in the journal Motivation and Emotion, researchers replicated and extended previous work by showing that tearful crying facilitates helping behavior and identified why people are more willing to help criers. First, the display of tears increases perceived helplessness of a person, which leads to a higher willingness to help that person. Second, crying individuals are typically perceived to be more agreeable and less aggressive and elicit more sympathy and compassion. The third reason I find most interesting: seeing tears makes us feel more closely connected to the crying individual. According to the study, “This increase in felt connectedness with a crying individual could also promote prosocial behavior. In other words, the closer we feel to another individual, the most altruistically we behave towards that person.” The authors refer to ritual weeping, say, after adversity and disasters or when preparing for war. Those common tears build bonds between people. I don’t LIKE crying. And certainly not in front of people. It feels humiliating, like I’m not in control of my emotions. However, I no longer practice smiling in front of the mirror or the sentiments that are packaged with the grin. I have learned to embrace my PDT — public display of tears — and be my transparent self, even if the result is more pig snorts. 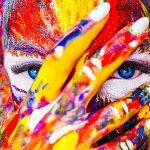 Busyness may seem fairly harmless; after all, you are just filling your schedule and accomplishing tasks, and there is nothing inherently wrong with that. 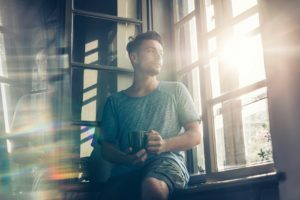 However, busyness can take over in ways that may be similar to how an addiction can and prevent you from being present in your own life with those around you. Here are some signs you might be addicted to busyness and how to address it. Someone who is addicted to being busy may feel a compulsive need to fill up their schedule. They may have difficulty spending time not “doing.” They may feel they are wasting time if they are not scheduling something or constantly have activities waiting in the wings. They may feel most satisfied when they see their calendar is completely full. In order to combat this mentality, it’s important to acknowledge this is a behavior you see in yourself. Acknowledging the constant desire to fill up your calendar is a good place to start. It may be helpful to look at the function of that behavior. What does it offer you? How do you feel when you see that your schedule is full? What are you getting out of moving from task to task without slowing down? And on the contrary, how do you feel when your schedule is empty? What feelings arise for you when there isn’t another task to complete? Being able to say to yourself what the busyness offers you is a good first step. Busyness can often cause people to become “social butterflies,” and they may feel a constant need to go from social What feelings arise for you when there isn’t another task to complete? Being able to say to yourself what the busyness offers you is a good first step.engagement to social engagement. These folks may say in passing, “I’m just social” or “I like to go out.” They may have difficulty being alone or spending time with themselves. If this sounds familiar, tune in to this feeling. What is it like to be alone? Connect with that. Does it bring up any other feelings or remind you of anything? Often, loneliness can remind us of difficult times during our childhood when we felt alone and no one came to be with us, so we take a lot of measures to not have this feeling be present. We try and fill it up with activities. We have to remind ourselves that feeling lonely is okay. We can notice this feeling and let it be what it is. You can practice building up tolerance to being alone by spending larger and large increments of time by yourself and observing how it feels. You can utilize some self-talk and let your body know feeling lonely is normal and that it’s going to be okay. 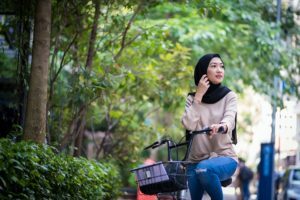 Often times, people will tell the busy person that it seems they are always busy or “on the go.” This may seem like an obvious indicator, but busy people may have difficulty recognizing this in themselves, so they need others to say something. If this is the case with you, it may help to ask the loved ones in your life about this. Be curious about what friends and family are telling you. Ask questions. “You say that I am often on the go, what do you mean by that?” “You often say that I am busy, does it feel like I’m present when I’m with you?” “Does it feel like I’m too busy for you?” This will give you a better sense of how your busyness is impacting others. That adage “stop and smell the roses” may seem cliché, but it can be hard to do for those who can’t stop being busy. If you find you have difficulty taking in the details of the day—the way your morning coffee tasted, the smile on your co-worker’s face, or the sounds of children playing in your front yard—because you feel like you must go onto the next item, you may be addicted to being busy. A good next step for this is to slow down as much as possible. Take a deep breath, pause, and notice what’s going on. You can start with your body: what does it feel like inside? Do you observe any tension or tightness? Do you feel happy, sad, lonely, mad, or something else? Where do you feel that feeling in your body? Can you allow it to move through your body? Next, see if you can move on to tuning in to the experience of others. Slow down and really listen to what they are saying instead of giving a rehearsed response. Can you tune in to what they might be feelings? Can you give yourself the space to really be present with others? Feel your way into what it’s like to be truly present with you family and friends. Being busy can be a good thing. As humans, we may often have a desire to be productive and use our time well. It’s when the busyness takes over our lives and we stop enjoying living that it’s important to look more closely. If you feel busyness has become a coping mechanism for you, therapy may help. A licensed mental health professional can show you strategies that allow you to tune in to your inner world, sit with your emotions, and learn healthy ways to cope. Nutrition is fuel for your body. Choose the right fuel and your body, including your mind, may function better. 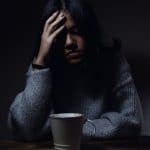 Research on the role of nutrition in fighting anxiety is mixed, but studies consistently find people with anxiety may have lower quality diets that are low in fruits and vegetables and high in fats and sugars. 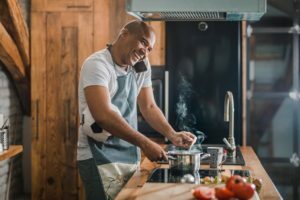 Emerging research also suggests some foods may help regulate neurotransmitters, thereby improving brain health and potentially reducing anxiety. Dietary changes are not magic, and a few nutritional tweaks are unlikely to correct serious anxiety or the lingering effects of trauma. They may, however, supplement the effects of therapy, medication, lifestyle changes, and other strategies. Diet changes may also help alleviate some of the physical effects of anxiety, such as muscle tension and a racing heart. Experimenting with a different diet can help people with anxiety feel an increased sense of control and self-efficacy. Many people with anxiety struggle with feeling out of control. Proactive measures to fight anxiety may help with this feeling. 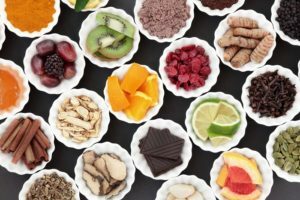 Be open to experimentation, and know that it can take time to realize the anxiety-fighting benefits of anti-anxiety foods. Nutrition affects anxiety in both direct and indirect ways. Low blood glucose can be an anxiety trigger, so crash diets and prolonged periods without food may make anxiety worse. Sugary foods, caffeine, and alcohol can also trigger or exacerbate anxiety. People struggling with anxiety may wish to cut back on these ingredients or eliminate them altogether. Experimenting with a different diet can help people with anxiety feel an increased sense of control and self-efficacy. Promoting general health. Some evidence suggests that simply eating a more balanced, nutrient-dense diet can help with anxiety. For example, some people report reductions in anxiety when they eat a whole foods diet or when they correct nutritional deficits. Neurotransmitter regulation. Certain chemicals, particularly eicosapentaenoic acid (EPA) and docosehexaenoic acid (DHA) may help regulate neurotransmitters, which are brain chemicals that help carry messages across a synapse. Many anti-anxiety and antidepressant medications also work on neurotransmitters. Vitamin D. Vitamin D deficiency is common, especially among seniors and those who do not spend much time in natural sunlight. Vitamin D supports healthy brain function and may regulate neurotransmitters. Doctors think it may be especially critical for regulating dopamine, a brain chemical that plays important roles in motivation and pleasure. Fighting inflammation. Inflammation is the body’s natural response to an injury. Chronic inflammation, however, can cause a wide range of maladies. Some research links it to anxiety. Foods that fight inflammation may help with anxiety as well as other chronic health problems. Salmon is rich in vitamin D, DHA, and EPA. It’s also a healthy source of protein and an excellent substitute for other meats. A 2014 study weighed the effects of salmon on men seeking inpatient mental health treatment. 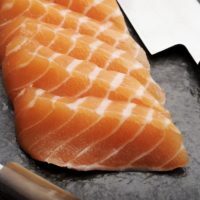 Men who ate salmon three times a week for 5 months had fewer symptoms of anxiety. Salmon was especially effective at alleviating physical measures of anxiety, such as a rapid pulse. Nuts and seeds are nutritionally dense foods that are rich in DHA. DHA is linked to improved brain health, including reductions in anxiety and better regulated neurotransmitters. Additionally, most nuts and seeds are high in selenium. Chamomile tea is one of the world’s oldest and most popular folk remedies for insomnia. This may be due in part to its effects on anxiety. 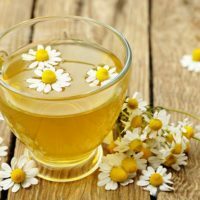 A 2009 double-blind, placebo-controlled study found that chamomile could modestly improve symptoms of generalized anxiety. Choline is an essential nutrient that plays a role in numerous functions, including supporting brain health, memory, and concentration. It’s also a precursor to acetylcholine. Preliminary research suggests choline deficiency may increase the risk of anxiety. Many vegetarians are deficient in choline, since the primary sources of this important nutrient are all meats. Eggs offer a viable alternative. Consider incorporating one or two hard-boiled eggs into your diet for a protein-packed source of this important nutrient. Dark chocolate is rich in antioxidants that can fight inflammation. It’s also a healthy substitute for milk chocolate and other sugary snacks. 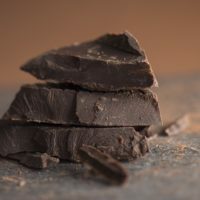 A 2012 study found that regular consumption of dark chocolate was associated with a decrease in biochemical measures of stress, such as cortisol production. For some people, dark chocolate can also be a powerful comfort food that eases stress after a difficult day. Inflammation may be a culprit in anxiety. Inflammation can also trigger other health issues, such as chronic pain and autoimmune disorders. These conditions can intensify anxiety. Fruits that contain antioxidants may help reduce chronic inflammation. Berries, especially blueberries, are high in anti-inflammatory ingredients. Citrus fruits are a rich source of the antioxidant vitamin C.
Turmeric has long been used in herbal medicine. Emerging research suggests it may play a role in general brain health, perhaps by fighting inflammation. 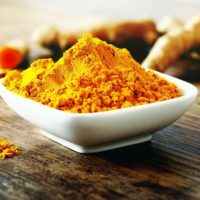 A 2015 study found significant reductions in anxiety scores among people who consumed turmeric. Most dairy products are fortified with vitamin D. For people who do not get enough vitamin D in the diet or who spend little time outdoors, vitamin D supplementation can ease anxiety. Dairy is also a rich source of protein. Particularly for people who do not eat meat, dairy consumption may ensure adequate protein intake. Protein helps the body produce key neurotransmitters, potentially improving mood and reducing anxiety. Every person is different. The ideal diet for one person can prove catastrophic for another. Foods that ease anxiety in some people may make it worse than others. For example, a 2015 case study details how fish oil supplements made anxiety and insomnia worse following treatment of depression. It’s important to consult with a doctor or mental health provider who is knowledgeable about nutrition and up-to-date on recent nutritional research. Even with expert advice, some people find their anxiety makes it difficult to adopt a healthy lifestyle or change their diet. The right therapist can help people overcome anxiety and make healthy diet and lifestyle changes. Therapy also supports people in understanding their anxiety, managing the lingering effects of trauma, and improving their quality of life. To find your therapist, click here. Even as we don’t like pain, it is a reminder that we are alive and have a steady pulse. Worse than heartbreak or rage can be the sensation of numbness, when you lose access to your feelings and can’t feel the sadness of an important loss or the aggravations that used to make you scream. Emotional numbness is a common, yet not talked about, symptom of depression. In an informational video, Will This Numbness Go Away?, J. Raymond DePaulo, Jr., M.D., co-director of the Johns Hopkins Mood Disorders Center, describes emotional numbness and helps people to distinguish between the numbness caused by depression and that from medication side-effects. He also assures anyone experiencing it, that it WILL go away. Nothing about hearing the word “depression” prepared me for having a moment of eye contact with my two-year-old niece that I knew ought to melt my heart—but didn’t. Or for sitting at a funeral for a friend, surrounded by sobs and sniffles, and wondering, with a mix of guilt and alarm, why I wasn’t feeling more. To further confuse matters, numbness can also be a side-effect of certain medications. A 2015 study published in the journal Sociology found that emotional numbness was among the dominating experiences of antidepressant use among young adults, and a 2014 study published in the journal Elsevier cited that 60 percent of the participants who had taken antidepressants within the past five years experienced some emotional numbness. That said, it can be tempting for people to assign blame on the medication when it is due to the depression, itself, especially in the initial weeks and months of treatment. The good-bad news is that ALL your feelings will return.